For those familiar with Chan-wook Park’s 2003 version of Oldboy, Spike Lee’s reimagining of the story may, at first blush, not appear very re-imaginative. Indeed, it may feel that there is a checklist of moments from the original Lee is crossing off as he goes along, but he’s also recalibrating the plot to fit within an over-the-top exploitation yarn with a tone all its own. If you embrace Lee’s Oldboy as a sort of inbred sister piece there’s a lot to like. It’s 1993 and Josh Brolin is Joe Doucett, a self-centered, alcoholic ad exec more concerned with martini lunches than his three-year-old daughter’s birthday party. After blowing a meeting, Joe goes on an all-night bender and wakes in a dingy motel room. But this room is actually a prison cell where he’s being held for reasons he doesn’t know. There’s a routine: He’s fed a steady diet of fried dumplings and vodka, a faux window goes dark when night hits, and he’s occasionally knocked out with gas if his jailors need to shave his overgrown beard or stop him from hurting himself. If Joe can work out who Copley’s character is and why he held him captive for two decades, this mysterious man will confess to the murder of Joe’s wife and give him 20 million dollars in diamonds. If he can’t, his now adult daughter will die. For this journey, the surrealistic atmosphere of the original is replaced with a brooding urgency that Lee and his star treat with an appropriate level of pomposity. There’s a sense of controlled glee in the recreation and “topping” of the iconic hallway hammer fight of Park’s film – this one takes place on two levels! – while Brolin’s gloomy gesticulations provide a reference point on which to regulate the more sensational aspects of the film. If Brolin is a grounding force, Olsen works as the earnest assistant at his side, fervently trying to help this wounded soul that reminds her of her own troubled past. Way at the other end of the spectrum is Copley’s antagonist, complete with implacable accent, sculpted beard, and nasty scar. If you find him grating you may know this film isn’t for you; on the other hand, if you sort of giggle every time you see him you’re probably in the right frame of mind to have a good time. Unlike most Spike Lee joints, Oldboy fully embraces genre trappings and doesn’t politicize or attempt to incite – though Lee can’t help himself from having Jackson look almost directly at the camera and utter the phrase “reparations must be made.” That unfortunate eye-roll aside, there are several delightful indulgences, from copious amounts of CGI blood to the ultra-contemporary and cold penthouse lair of the bad guy. These elements don’t fully congeal however, the final act a collection of isolated events and stories giving us just enough to understand the ultimate revelation of “why.” There are rumors of a Lee three-hour cut of the film that may add more context, but I think something between that and the truncated 1 hour and 40 minute version would suffice. A common complaint about remakes – especially American remakes of beloved foreign films – is that they’re dumbed-down or scrubbed of nuance for mass appeal. 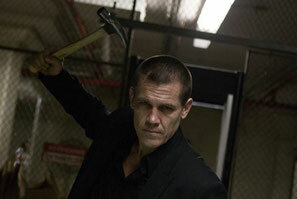 While this version of Oldboy is different, it certainly isn’t pandering for universal love. It does its own thing and for the most part does it well. Those that love the original (a group that includes yours truly) would be best served to accept this vision on its own terms. With a finale that is more of a gotcha than a guttural shock to the system, this is a unique experience, and one worthy of experiencing.